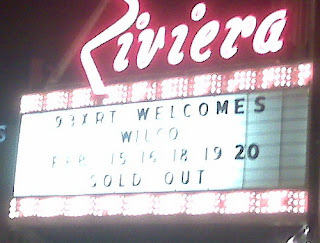 Wilco was as magical as I hoped it would be. The show was smoking. They played a full set or about 3 hours. I'll never forget the encores. These were real encores with the crowd demanding they keep playing. The last one came about 5 minutes after they had already turned on the house lights and were playing music over the loud speakers. I was watching and not a single person moved. People were going nuts and the band was kind enough to come back out for a rockin' Hooodooo Voodoo that the guitarists just rocked. Here is a link to my Tumblr blog for a couple pictures I snapped. I'm having technical difficulties so a few more might appear. Full song list here. The songs that stand out for me are below and I've embedded a playlist here but these aren't the live versions that I love so much. Hell is Chrome - song number two of the concert and off of Ghost is Born album. I've been meaning to write a review of this song alone. Basically I think it's one of the best fusions of lyrics and music that the band has. More later but I think this song deserves a lot of attention. It might not jump out at you though. Handshake Drugs - amazing undertow to this song. the guitars are fantastic but the real story is the baseline and drums. Via Chicago -love song to the city of Chicago. I certainly connected, this being my first visit back since I graduated from Kellogg in June 07'. I sang my lungs and heart out to this one. I Am Trying to Break Your Heart - this song started it all for me and Wilco. After I heard this on Yankee Hotel Foxtrot, I was hooked. It was raucous to say the least. Jesus Etc - Andrew Bird, an epic chicago guy, came on stage. Tweedy made fun of him a bit and then they played this amazing song. Kingpin - Songs is incredible and the audience participation is so much fun. "I want to be your Kingpin..."